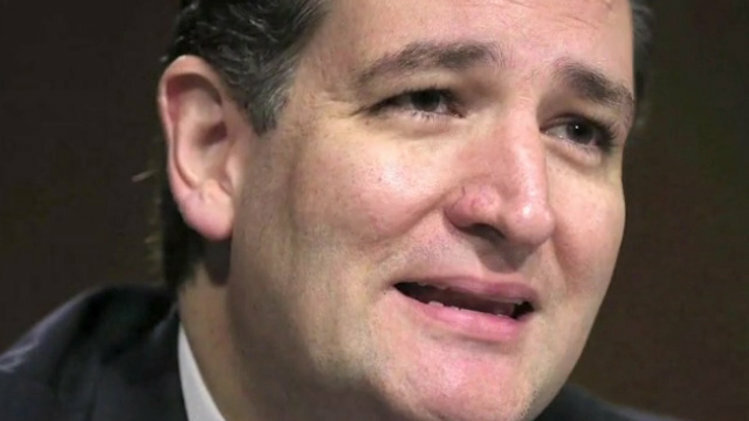 Sen. Ted Cruz: The mouth that bored. In a less diverse Republican presidential field, Ted Cruz, the make-good son of a Cuban immigrant, would be viewed more for what he is – a candidate with a legitimate shot at making U.S. history as the nation’s first Latino president in 2016. Instead, the senator from Texas finds himself in a strange position as he sees himself eclipsed both by Senator Marco Rubio, also a Cuban-American, and former Florida Governor Jeb Bush, a fluent Spanish-speaker married to a Mexican-American, as early favorites among Hispanic Republicans who could play an increasingly influential role in the nomination process. To Latinos, Cruz often feels more like an afterthought. And while that’s largely attributed to his hard-right stance on immigration reform, prominent Hispanic conservatives offered insight as to why his problems with Latinos run deeper. Rubio, they said, has embraced his ethnic identity in a way that Cruz, who speaks little Spanish, has not or will not. “At times, Senator Cruz finds it difficult to identify or engage with his Latino heritage,” said the Rev. Samuel Rodriguez of the National Hispanic Christian Leadership Conference, a key conservative group that Bush addressed in April. Hispanic voters could matter in this year’s Republican presidential race like never before. Nevada, with a one-quarter Latino population, holds the third Republican primary on the calendar, with contests in Colorado and Texas not far behind. Because no clear front-runner has yet to emerge, the nominating process could stretch longer than usual and involve more states, meaning that the traditional early states of Iowa, New Hampshire, and South Carolina, which largely have white Republican electorates, will hold less sway. More than that, it’s critically important for the party to attract Hispanic voters, something it failed to do in 2012, when Mitt Romney garnered a meager 27 percent of the vote in the general election. Rubio’s pollster, Whit Ayres, estimates the party will need to garner at least 40 percent of the Hispanic vote in 2016 to win, as the share of America’s white electorate declines. That’s one reason Cruz’s campaign insists it is not ceding any ground in the effort win over Latinos. “Hispanic outreach is going to be very important to him,” said Catherine Frazier, Cruz’s spokeswoman. His campaign told Reuters that it has hired one staffer dedicated to Hispanic outreach and will be using Cruz’s Cuban father, Rafael, as a surrogate to speak to Hispanic faith groups. Cruz isn’t the first minority candidate to face questions from his community about his cultural bona fides. In 2007, at just this stage of the race, Barack Obama’s campaign endured a bevy of stories centered on the question of whether the Hawaii-born son of a Kenyan father and white American mother was “black enough” to be the first African-American president. Obama ultimately transcended those doubts and drove black voter turnout to record levels. Cruz may face a tougher road in garnering Hispanic support, not only because of the presence of Rubio and Bush in the field, but because of his arms-length approach to his cultural identity. While Rubio stayed in Miami immersed in the Spanish-speaking Cuban exile community, Cruz, born in Canada, settled in Houston with his father and mother of Irish-Italian descent, Eleanor, and quickly was assimilated into American culture. Rafael Cruz strongly believed his family should speak English. Cruz, whose first name is also Rafael, went by Ted, and attended evangelical schools. “I’m Cuban, Irish and Italian, and yet somehow I ended up Southern Baptist,” Cruz has joked. Unlike Rubio, who has made his Cuban-American heritage a centerpiece of his campaign, Cruz seems more comfortable presenting himself instead as a blunt-talking Texan – down to the cowboy boots he wears with his suits – than as a self-identified Hispanic. Despite the Spanish-language ads by Cruz’s campaign, Hispanic activists say his inability to directly speak to the estimated 35 million U.S. Hispanics who speak primarily Spanish is a major disadvantage in this race. “Jeb Bush and Rubio – they can be on Univision one minute and CNN the next,” said Daniel Garza, executive director of the conservative LIBRE Initiative in Miami. Cruz’s campaign rejects the idea he is limited by language in connecting to Latino voters. “Many first and second-generation Hispanics grew up in similar households,” Frazier said. Garza, like many Hispanic conservatives who spoke to Reuters, was quick to praise Cruz’s intellect, but it was clear that Rubio or Bush was their first choice. And, to be sure, the major reasons are political, not cultural. Cruz’s stance on immigration is viewed by many Hispanics across the political spectrum as unduly harsh and inflexible. Cruz was an ardent opponent of the 2013 immigration bill co-sponsored by Rubio. And although Rubio, under pressure from conservatives, eventually turned against the bill as well, he appears to be getting credit from Latinos for trying to push toward a solution to the nation’s immigration crisis. As part of his outreach effort, Cruz addressed the U.S. Hispanic Chamber in April, arguing that the Republican Party is the natural home for voters who value entrepreneurship, family, and self-reliance. But that approach belies polls that show a majority of Hispanic voters favoring a path to legal status for illegal immigrants, support for Obama’s signature healthcare plan, and government social programs. That means that whoever the Republican nominee is, be it Cruz, Rubio, Bush, or someone else, they will face an uphill battle in convincing Hispanics to defect from the Democrats, who enjoy a large monopoly on their vote.